A birthday party will be more fun when you have some great games ready for kids to play. Just look at this listing of games birthday party ideas that you and the kids at your event can enjoy. These include some of the most popular traditional games around. Capture the Flag. This classic game lets kids find and defend flags in a large field. Anyone who has a flag can be tagged to drop it. The goal is to retrieve another team’s flag and bring it back to one’s base. Tug of War. The traditional game of tug of war is popular among larger groups of kids. It is about seeing which side can pull a rope the hardest. Water Balloon Fight. This next activity works best during the hot summer months. Just fill up a bunch of balloons with cool water and watch as kids have fun throwing them around at one another. Three-Legged Race. This game requires a bit of concentration, but those who can pull it off will surely complete the race faster. Two people have their legs tied together with the goal of getting to the finish line before other pairs of people can do this. Obstacle Course. Anything can be used in an obstacle course. Prepare a large path and see how well kids can move around that spot. You can also time kids to see how long it takes for them to go through a course. The fastest one can win a prize. Charades is a traditional game that people of all ages love. One person has to non-verbally act out something to try and get other people to answer it correctly. Laser Tag. 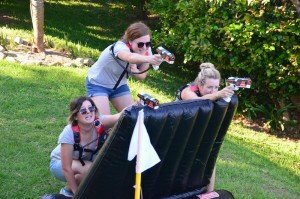 Laser tag is fun as it gives kids the opportunity to run around in a big field and chase after each other with the goal of shooting down enough targets. You can organize a laser tag game with many variants with different obstacles and objectives laid out all over the place. All of these games birthday party ideas are worth considering for the next big party you plan on hosting. Get in touch with Laser Warriors to learn more about what you can get for a birthday party.